As digital parents, we probably all have that image of us sitting down with our tween or teen and having a calm, open conversation about their technology use. In this dream, we are both expressing our concerns and opinions in a mature, warm chat, and a mutual understanding washes over both of us as we enjoy a soothing cup of tea and bask in our perfect relationship. More often, we’d have to admit, “discussions” about tech begin as a simple question on our part and quickly devolve into an eye-rolling, stiff-necked power struggle at best. At worst, a screaming match. It is easy, then, to simply avoid these conversations rather than stir up drama. So, how do we approach the topic when our kids are less than enthusiastic about sharing anything relating to their secret digital world? Here are five very different tactics. Try the one (or ones) that fit your parenting style and your child’s personality. This doesn’t have to be done as a threat (and I suggest you don’t use it as one.) Instead, it’s a real either-or option that your child has. After you express your parental duty to keep them safe and healthy, leave it up to them how they want this to happen. Open lines of communication or prying-and-spying? As with all real options we give our kids, we need to be prepared for either choice they make. If they choose openness, great! Start having gentle, non-judgemental chats as often as they are comfortable. If they choose the latter, I suggest you go total KGB on them. Seriously. Turn on every parental control on every device, filter almost everything, monitor their usage and mention it to them every few days. Pay the extra couple bucks to use the parent monitoring tools on your mobile service. George Orwell, eat your heart out! The purpose of this, of course, is not to create a police state in your house. Your ultimate goal is open communication, which is always preferable to the alternative. In a generation where most kids have their “own” devices, it is easy for them to get the impression that this also equals freedom to do what they want online. They may have been left largely to themselves and don’t feel that there is anything to talk about. Time to parent up. Sometimes our kids need to be reminded that there are boundaries and expectations in our home. Believe it or not, children crave these boundaries…especially in the online world. A less heavy-handed approach is to empower your child to be the expert. Most kids (even surly teens) usually shine when you give them the opportunity to teach. Genuinely honor them for the stuff they know and express interest in learning from them. Not only does this “student” posture make you less threatening, it gives you some insight into their world. Even if you don’t really care about ever using Snapchat yourself, you pick up on what kids are sharing and what your own son or daughter understands about it. You might even realize that they are more careful about online sharing, for example, than you suspected. You need to keep these learning sessions positive. This is not a time to get preachy or bring the hammer down. These friendly chats will lead to more open conversations later about technology and the genuine concerns you may have. When it does come time to voice a legitimate concern about your kid’s online behavior, approach it in a way that creates a conversation about the topic, not about your tween or teen. This is an indirect method of allowing the conversation to roll around to your own child’s behavior. If they feel like it’s a full-on attack based on your suspicion of them as a person, they’ll throw the barricades up. This is a more organic and less planned type of conversation. Sometimes, a news headline or local story can trigger this. Sometimes, the conversation naturally turns to online behavior and safety. The key is that you have to let it happen naturally. 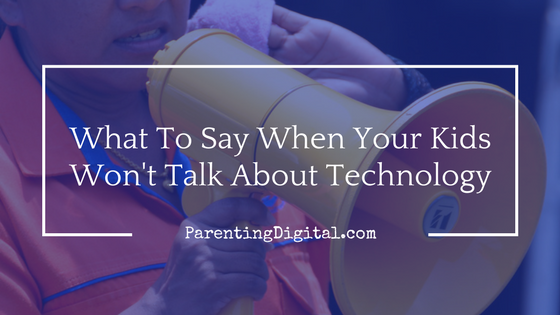 Sometimes, you simply can’t get your tween or teen to open up about their tech use. Apart from being a bit of a warning flag, it is also a frustrating and helpless feeling. You are not alone. Reach out to other parents you know, especially parents of your kid’s friends. Ask them what they are hearing from their own kids about online behavior. Are they feeling equally frustrated? How have they handled it with their kids? This is not a time for pride. Ask questions from a place of humility and genuine interest. Join a parent group, if you aren’t already in one. Even online groups can provide some information and perspective you might need. The side effect of these connections is that it empowers you with the questions to ask your own kids. In other words, reaching out to other parents when conversation with your child gets difficult may actually open up the conversation with your child. When your child is unwilling to open up about tech, what approach works best for you?